To view our current inventory of exceptional antique & vintage weapons and naval officers' dress swords, click here! 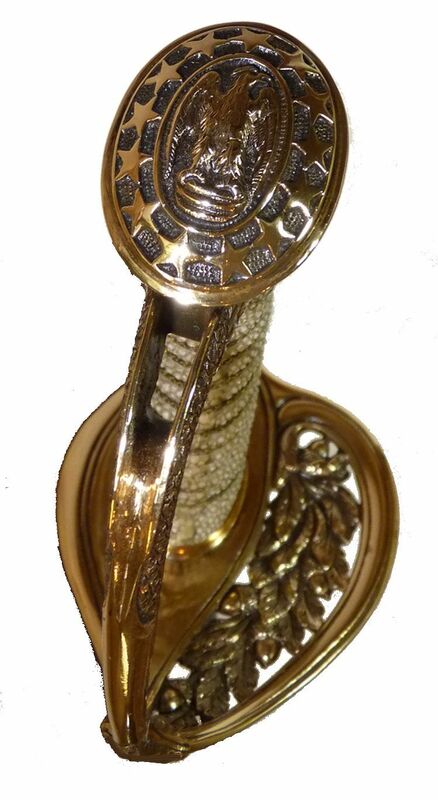 This Outstanding Naval Relic Has Been Sold. Thank you! Length Overall 35 3/4” long Blade 30 1/4” long by 3/4” wide 1/4" Thick LOA 36 1/4"
Presented is a M1852 sword named to Harry E. Stevens, a naval officer born in 1884 who entered the service prior to 1900 as a seaman apprentice 3rd class at Naval Training Station, Newport, RI. Nine years later, at the time he was presented the sword on December 30, 1909 he was a commissioned officer, most likely with the rank of ensign. 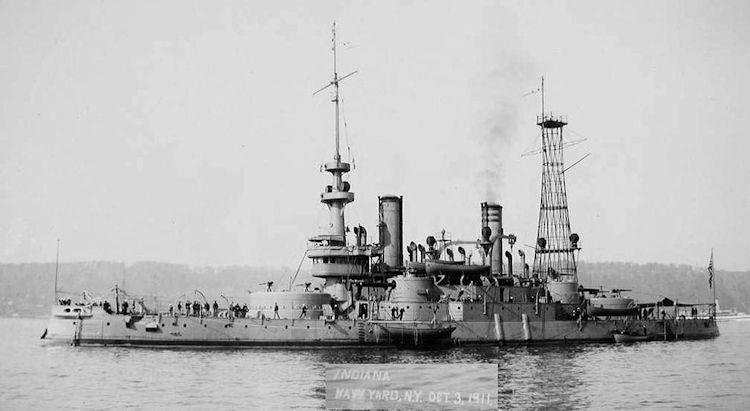 This information comes from official U.S. Navy records for the years 1900, 1911, 1912, 1918 and 1921. Further details are provided in the 1910 Census of the United States in which he is listed as a commissioned officer. There are no internet citations that follow his career, but there are copies of census documents for the years 1900, 1910, 1920 which also show the station and his rank of service. For example, the 1920 Census lists him as a lieutenant serving in USS Prometheus AR-3. The 1930 census indicates he entered civilian life. The presenter, Anders G. Lagg is known to have been a chief turret captain, an enlisted rank equivalent of chief petty officer, serving through the end of WW I. 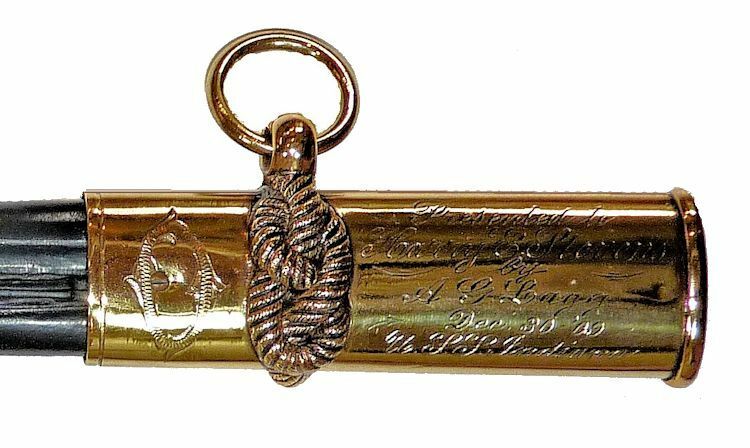 There is no record of what noteworthy event occurred for Lagg to have presented his superior with a sword that has a connection with Stevens and the USS Indiana BB-1. That said, the quality of the sword is exceptional, something that is not seen in what is being offered today's naval officers. For this reason alone it should appeal to someone who is seeking the best of what was available at the Turn of the 20th Century and thereafter in a naval officer's M 1852 sword. This sword's blade is approximately 1/4 inch wider than contemporary swords of this same model. DIMENSIONS: Blade: 3/4 inch wide, 1/4 inch thick, 30 1/4 inches long, Hilt 5 1/4 inches long. Length overall 35 3/4 inches. In scabbard 36 1/4 inches. Fuller 16 1/2” x 1/2“ Weight sword 2 Lbs 1 1/4 oz. CONDITION: When received the leather scabbard was in tatters and missing the last 6 inches of its length. However all the hardware was present. The blade, on the other hand, was immaculate with no stains or darkening and sparkled in its brilliance. The hilt was very good except that the brass had darkened and there was hardly any evidence remaining of the original gold wash. The sharkskin covering - shagreen was also in very good condition with only a little loss. The two strand wire wraps are tight over the shagreen grip's cover. Most of the gilding was worn off with a patina of age which was in contrast to the new condition of the blade. Consequently, we decided to have a the sword housed in a newly made scabbard using the original hardware. I. Bernstein, Brooklyn, NY, primarily known as a jeweler, is etched on the obverse ricasso on four lines. On the reverse is a brass proof logo with a French style fleur de lis centered. The country of origin began to appear on blades starting in 1892 so we are not certain that it is American made. There are twelve wraps woven as half hitches in two strand wire on the white shark skin covering the grip. The single fuller is 21 1/4 inches. The number of stars in the 1852 design was 13. The dolphin on the drag is mounted with its head on the side away from the hangers per the official design while the eagle on the pommel faces right surrounded by 13 stars. Thirteen stars is what was called for by the official 1852 blade design. * To 5/8 inch in today's Navy. The regulation of 1852 had the eagle on the pommel facing right when viewed from behind. The use of the officer's sword was suspended on 15 October 1942 and was not authorized officially again until 1954. Source Naval Historical and Heritage Command. International buyers welcome, but inquire first. We have satisfied customers in Argentina, Australia, Austria, Belgium, Bermuda, British Virgin Islands, Canada, Chile, Republic of China, Czech Republic, Democratic Republic of Congo, Denmark, Estonia, England, France, Germany, Greece, Holland, Hong Kong, Hungary, Iceland, Indonesia, Ireland, Israel, Italy, Japan, Kuwait, Latvia, Luxembourg, Malaysia, Martinique, Mexico, New Zealand, New Herbrides (Vanuatu), Nigeria, Norway, Nova Scotia, Panama, Philippines, Poland, Portugal, Puerto Rico, Romania, Russia, Saudi Arabia, Scotland, Singapore, South Africa, Spain, St. Maarten, Sweden, Switzerland, Thailand, Turkey, United Arab Emirates, USVI, Vanuatu (New Hebrides) and the Eastern Caribbean. ACCEPTED FORMS OF PAYMENT are Bank wire transfer, cashier's check, or personal check in which case the item will be held until cleared. Our prices are quoted net to seller, but credit cards may be accepted through PayPal by special arrangement at an additional charge. Copyright 2016 by Land And Sea Collection™. All Rights Reserved.